ABSTRACT. Artificial reefs represent effective ecosystems for restocking but they are also extremely delicate and sensitive environments because they represent hotspots for tourists. For this reason the impact of recreational diving on artificial reefs should be taken in consideration since inexpert divers and photographers can strongly affect benthic communities. 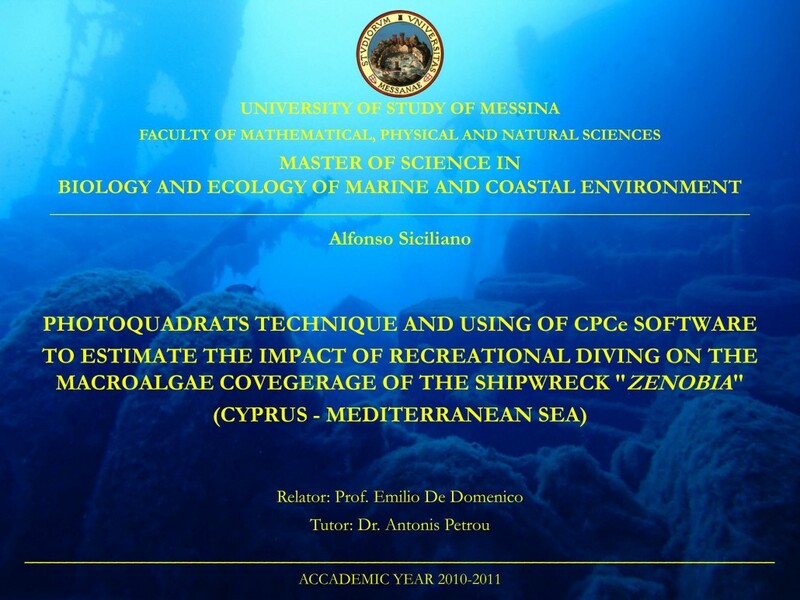 The aim of this study was to assess the effect of recreational diving on the macroalgae coverage of the shipwreck “Zenobia” in Larnaka (Cyprus). This shipwreck is an excellent example of artificial reef affected and partially damaged by anthropogenic activities, since it is one of the Top 10 wreck dives and one of the Top 25 diving sites in all the world. The macroalgae coverage was considered as indicator of physical damage caused by recreational divers and compared in three transects on the exposed side of the shipwreck, using the photoquadrats technique and the Coral Point Count Excel extension software. This study remarks the importance of digital imaging samplings in habitat characterization since these techniques offer an excellent compromise between dive time and data accuracy, offering an excellent alternative to destructive samplings. In addition, this study supports the effectiveness of digital image analysis software, such as CPCe, thanks their accuracy and completeness althought their simplicity, making them almost indispensable tools in scientific diving.